The Great Wolf Lodge at InternationalWest in Garden Grove (around the corner from Disneyland) marks the company's first location in California and the first indoor water park resort of any kind in the state. It offers the same kind of fun as the chain's other highly themed resorts in Wisconsin Dells, Sandusky, Ohio, Niagara Falls, and elsewhere. 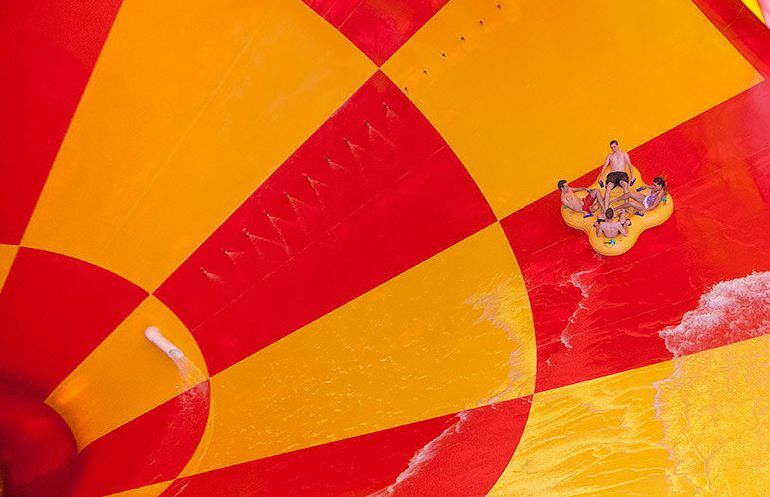 At 121,000 square feet, the California water park is one of the biggest in the Great Wolf Lodge portfolio and among the biggest indoor water parks in the world. Howlin' Tornado - Riders soar up and down the sides of a huge funnel in four-passenger cloverleaf tubes. River Canyon Run - Groups careen through a large, enclosed slide in the family raft ride. Wolf Tail - Brave riders enter a launch pad and wait for the trap door in the floor to open. The thrill ride includes a 360-degree loop (although it does not send passengers completely upside down. Wolf Rider Wipeout - Grab a boogie board and ride the surf. MagiQuest - The extra-charge interactive experience immerses players in a high-tech, multi-player fantasy environment that is somewhat like walking into a video game. Howly Wood XD Theater - Another extra-charge attraction, it's a 3D motion simulator ride. While it's not as sophisticated, it is somewhat like the Despicable Me Minion Mayhem Ride at Universal Studios. Howl at the Moon Glow Golf - Mini golf with black light effects. Ten Paw Alley - Bowling for little kids. Lazer Ferenzy - Laser tag. A full-fledged resort, the Great Wolf Lodge also features a huge arcade with redemption games, on-site restaurants, a fitness center, and an Aveda Concept Spa to pamper and help get the wrinkles out of waterlogged guests. The California resort also offers a 30,000-square-foot conference center, activities for younger children, and a Scooops (sic) Kid Spa for tweens that offers pedicures and other treatments. The lodge offers 600 kid-friendly accommodations that include all-suite guest rooms. As with the other Great Wolf Resorts, waterpark admission is included in the room rate. The water park is open to registered hotel guests only, and day passes are not available for the general public. Get rates for Great Wolf Lodge at TripAdvisor. In Garden Grove, California (next to Anaheim), part of the InternationalWest district. The address is 12681 Harbor Boulevard in Garden Grove, near Disneyland. From Los Angeles: I-5 S to Exit 110A, Harbor Boulevard. Right onto S. Harbor Boulevard. From San Diego: I-5 N to Exit 1A onto CA-22 W via Exit 106. Take Exit 13, Haster St. Right on Haster St., left onto Lampson Ave., left onto Harbor Boulevard. Find other Great Wolf Lodge resorts in the Great Wolf Lodge Resort Guide. Want to go hiking in Yellowstone? These are the best trails!